There was an inspiration challenge posted in the There She Goes Forum to take inspiration from an absolutely scrumptious cupcake blog and I HAD to play, since I'm obsessed with cupcakes! I just found TSG because they sponsored Sheetload this month (I'll be posting my cards for that soon) and am so glad I did! They have the most adorable set called Cupcake Mix & Match and it's so much fun!! 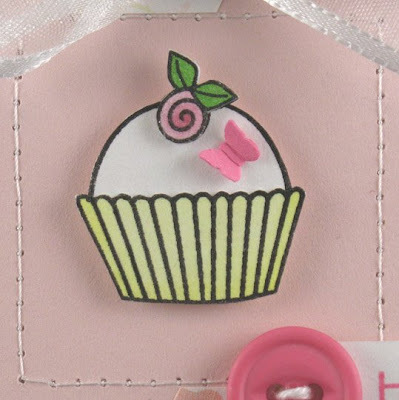 There are a bunch of different pieces so you can design your own cupcake, and that's just what I did! I stamped the liner and smooth cupcake lines and then the rose. I also stamped the rose separately, colored and cut it out, and then popped it up on top after I cut out the whole cupcake. The little butterfly is a Fiskars hand punch - isn't it cute? The sentiment is also from the set and I really like the pretty font. For the design of the card, I also took inspiration from a card by Kim Hughes that was in the January 2009 issue of Cards Magazine. I love how she made a simple frame of straight stitching and then filled the frame with punched circles. I copied that idea, but instead used the punched circles as background, and I also added another frame of zigzag stitching. Hope you like it and TFL!! 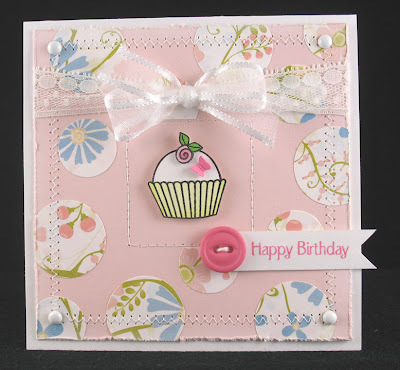 Other materials used: Sweet Blush cardstock (base layer), Hibiscus Burst cardstock (butterfly) and ink - Papertrey Ink; patterned paper - Chatterbox; ribbon - May Arts; 1" and 3/4" circle punches - Stampin' Up! ; brads - Pink Hedgehog Papercrafts; lace and button from stash. This is really gorgeous!! Wow!!! This card is so sweet! Love the butterfly on that cute cupcake! your card is so beautiful. i love the cupcake!! Pop Tart Card and More!